I thought I would try a honey glaze for my salmon tonight. This was just a quick dinner so I think I will make it a quick post. Heat the oil in large skillet. Add to skillet the stir fry vegetables and cook over high heat for about 5 minutes. Push the veggies to the side of the skillet and place salmon in the clear area skin side up; reduce heat to medium. Drizzle half of the soy sauce over the vegetables and cook the salmon for about 4 minutes occasionally stirring the veggies. Flip salmon over and drizzle with honey and remaining soy; sprinkle with pepper. Cook an additional 3 – 5 minutes until cooked through. Charles made some awesome fried rice with the teriyaki chicken a couple of days ago. I really enjoyed this; it’s one of those dishes that it is easy to eat too much though. I loved everything about it; the crunch of the water chestnuts, the eggs, the peas; oh so very tasty. 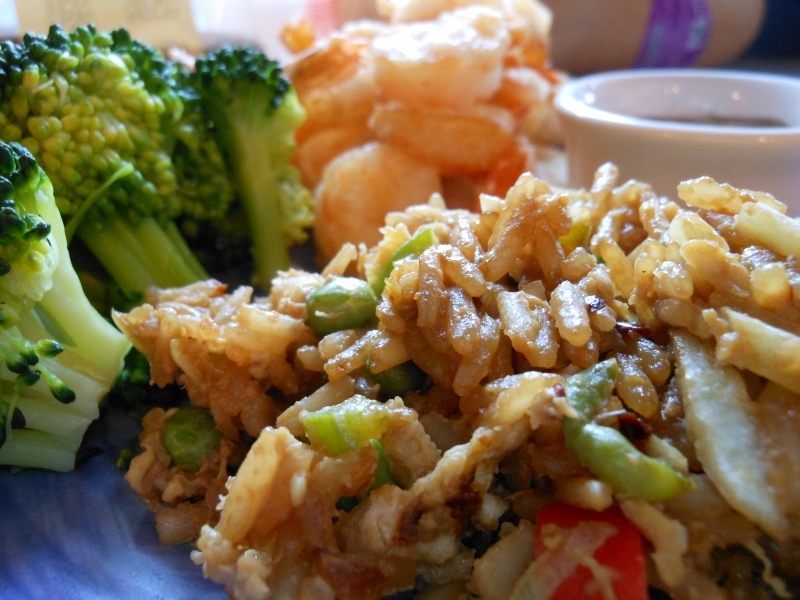 Cook rice for 9 – 10 minutes; this will leave the rice slightly undercooked. 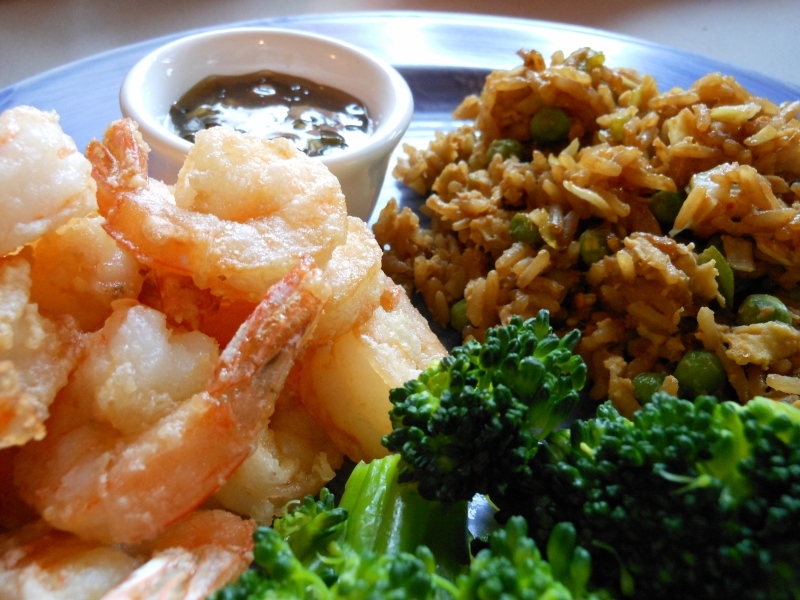 Rinse rice well and drain thoroughly; spread rice to dry out while prepping remaining ingredients. In large skillet heat sesame oil; sauté carrot, celery, onion, jalapeno, and crushed red pepper for 6 – 8 minutes or until veggies are tender. 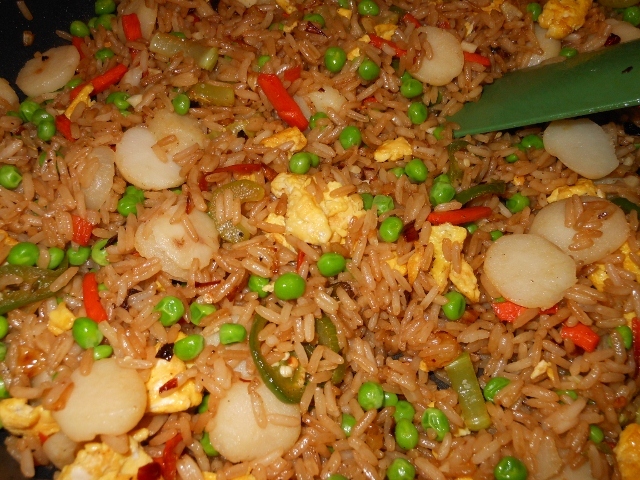 Add rice, eggs, soy, garlic, peas, water chestnuts and pepper; cook over medium high heat for 5 – 10 minutes. I had to put some of that red hot sauce Charles made to work with some stir fry. 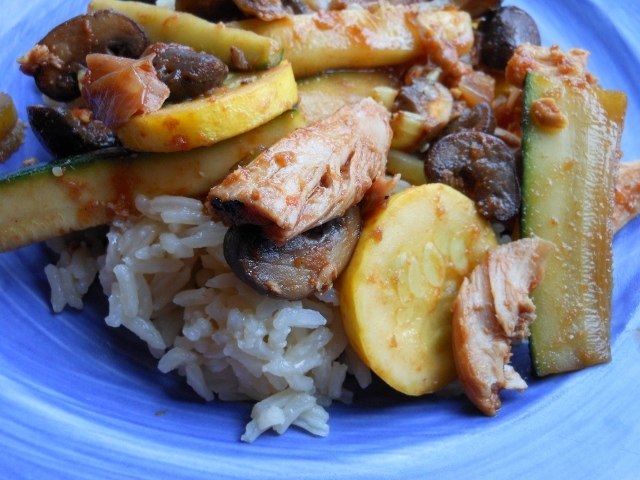 Some left over chicken and the veggies from the farmers market made it easy to throw together. I like to just throw together recipes with what I have on hand so adjust as desired if you have different veggies or sauces. Many times I use pineapple with the red hot sauce for a sweet and spicy effect today I just went for spicy. 2 cups mushroom ~ about 8 o.z. 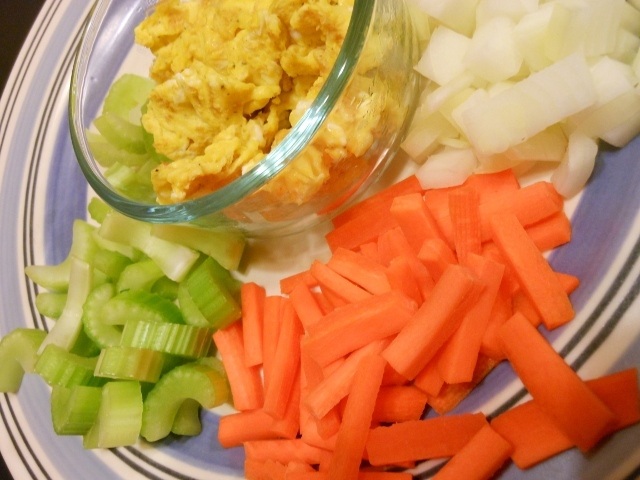 Cut veggies to desired size. I like a combination of shapes and sizes some slices and some chunks. 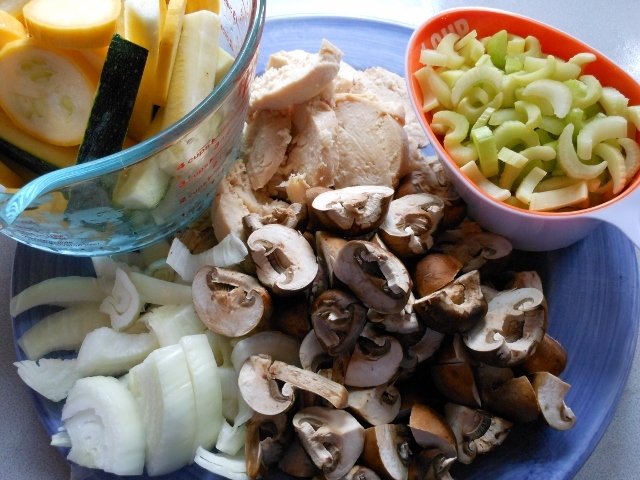 Heat oil in large skillet or wok; add celery, onion, and mushrooms. Saute for about 5 minutes over medium heat. 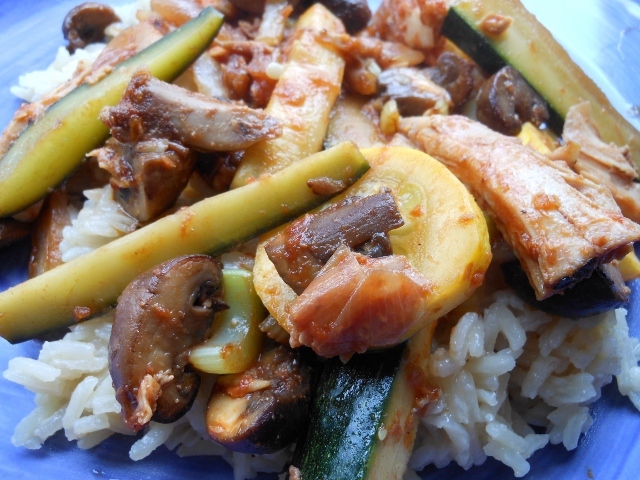 Once nearly tender add zucchini and squash continue cooking for about 3 minutes. Add cooked chicken, soy, ginger and red hot sauce. Cook until heated through and veggies are desired tenderness about 2 more minutes. 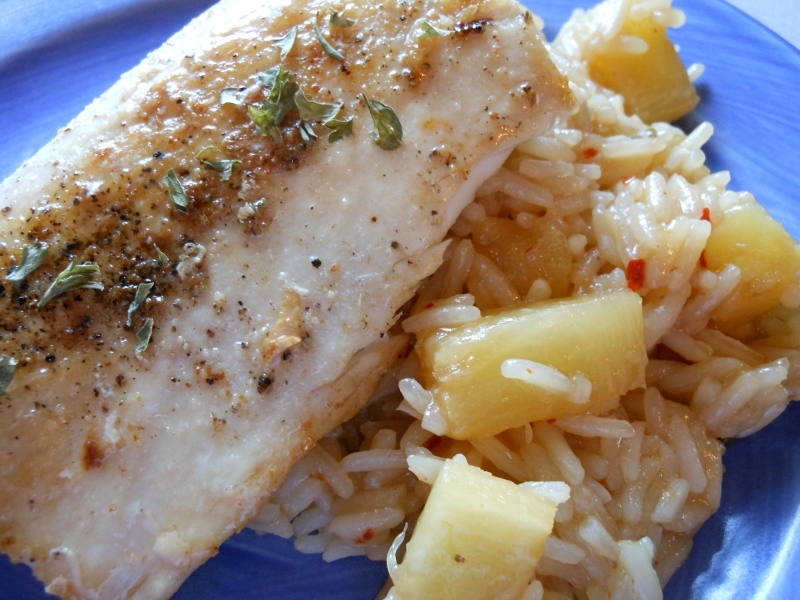 Serve with rice and additional soy and red hot sauce if desired. I wanted to do a little something different with my rice today. 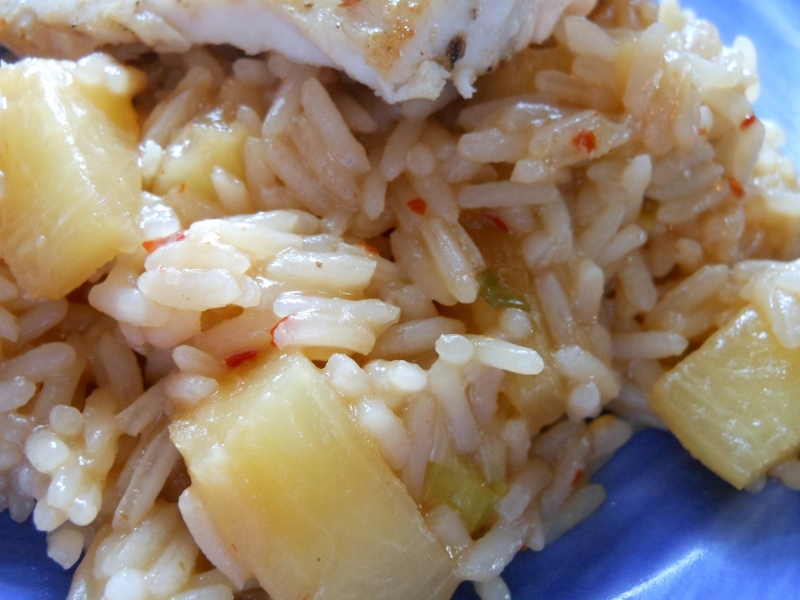 Thought a pineapple rice would be a tasty side for the Mahi-Mahi I was fixing for dinner. I added a spicy kick and a bit of soy along with some brown sugar and orange juice for a sweet and sour spicy asian flair. In medium sauce pan bring broth to a boil; add rice and cook for about 10 minutes. In small sauce pan combine remaining ingredients except green onions and simmer for about 5 minutes; stir mixture into partially cooked rice and continue cooking for about 10 more minutes over low heat. Stir in green onions add salt and pepper if desired and serve. 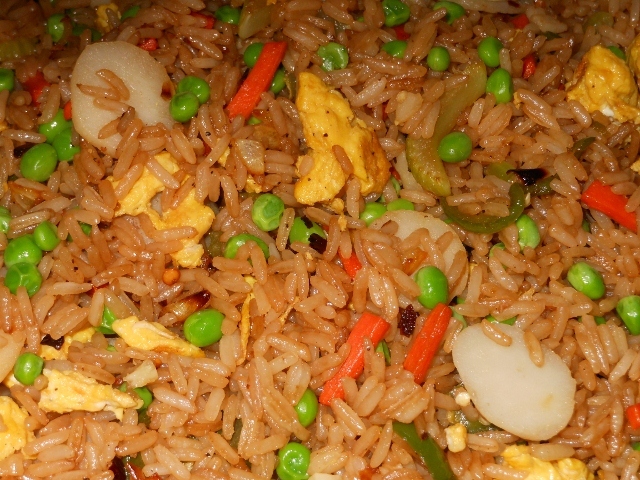 Fried rice is one of those things I don’t really have much experience making. I enjoy it and going vegetarian wasn’t exactly my intent when I started making it today. I just wanted a great side dish to go with the fried shrimp and homemade asian zing dipping sauce. In fact when I took my first bite I blurted out “there was bacon cooked in the fridge”; well that and I “forgot the water chestnuts”. It was one of those recipes I did with substitutions. Normally I would have used celery but I was out; so cabbage instead. As for green onion diced yellow onion would have to do. I was just trying to make this with what I had on hand. The results were very tasty. There are a few changes I would make on the next batch. Like cooking the rice ahead, cooling, and maybe rinsing to keep it from being sticky. We were just debating if vegetarians eat eggs … if you don’t eat eggs leave them out. Our eggs however were free range with a vegetarian diet if that helps! Cook rice for 10 minutes; the rice will still be chewy. Rinse the rice if desired; I chose not to as to maintain the nutrients but the rice was sticky when finished. Heat olive oil in large skillet or wok. Add onion, peppers, and crushed red pepper sauté 3-4 minutes until tender. Add ginger, rice, garlic, peas, and soy sauce; continue cooking about 5 more minutes over medium heat. Add cabbage heat through; push rice to sides of pan and add egg to middle stirring to break up as it cooks. Toss everything together and serve.